The Jewish Community Center here in Asheville, NC, received a bomb threat yesterday. 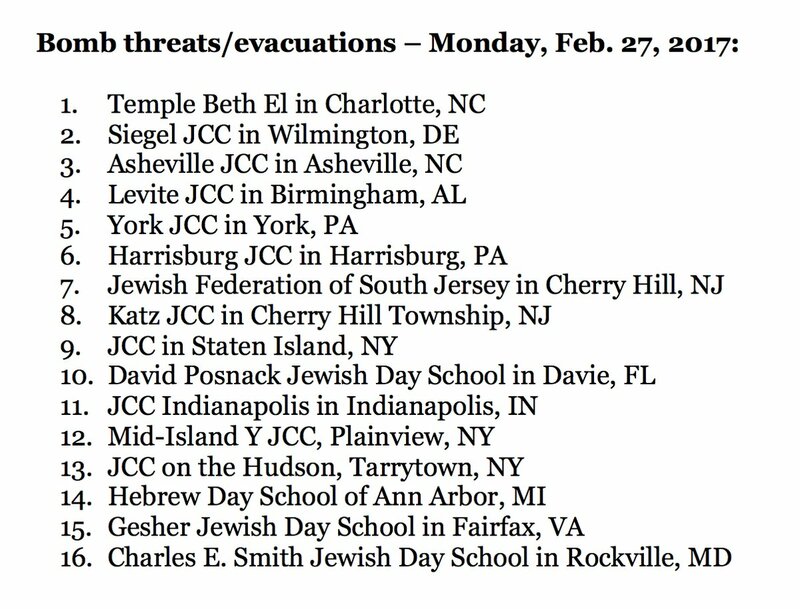 That, in itself, is scary enough, but ours was just one of 16 Jewish centers that received bomb threats yesterday. Sixteen in one day. That’s not a coincidence. Ever since the person occupying the White House was elected, hate has been on the rise. Bigots and racists have gotten the message loud and clear: Hate is in vogue again. The incidents began immediately after the election. A Jewish friend of mine in Florida came out of synagogue and put her grandson into the back seat of her car, and as she drove off, she was followed by a pickup truck with bumper stickers supporting the person who won the electoral college vote and sporting a confederate flag. They pulled up alongside her car and began shouting anti-Semitic remarks. Muslims began to report being harassed, as did LGBTQ people. Sporadic reports came in of violence, threats and vandalism at mosques, synagogues and cemeteries. In the month after the election, the Southern Poverty Law Center documented nearly 1,100 incidents of bias-related harassment and intimidation like the one my friend experienced. Last Wednesday, a white man walked into a restaurant in Olathe, Kan., and shot two Indian men, killing one, while shouting, “Get out of my country!” A third man, a white man who tried to intervene, also was shot and is recovering. The man in the White House said these incidents have nothing to do with him and his rhetoric, but I disagree. When you rail against immigrants, when you say all of Islam is evil, when you ban Muslims from traveling into our country and detain and search and harass anyone who looks Muslim at the airport, when you fail to mention Jews on Holocaust Remembrance Day, when you appoint a known white supremacist as your chief advisor, you encourage hate. It used to be unfashionable to be a racist, but now they are emboldened by the election of one of their own. What’s worse is that no one in Congress is calling for an investigation into this coordinated effort to intimidate Jews — and let’s not pretend that’s not what this is because 16 bomb threats against Jewish centers in a single day isn’t a coincidence. I sent faxes to both my senators and my representative, calling on them to denounce this hate and to call for a federal investigation, since this went across state lines. I stand with my Jewish brothers and sisters. I also stand with my Muslim, LGBTQ and immigrant brothers and sisters from around the world because I take seriously the commandment to love my neighbors — and all of humanity are my neighbors.